Did your furnace give up on you this winter? Here at Sanders and Johnson, Inc. Heating and Air Conditioning, we have years of experience working with all types of furnaces. 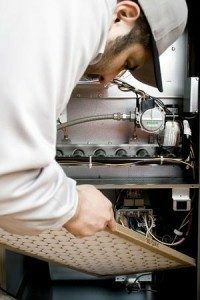 We’ve been provided furnace repair and replacement in Denver for 40+ years. The cold Colorado winters can be brutal without any heat, but you don’t have to suffer! It is always important to call a licensed professional to work on your furnace because of the gas and high electrical energy required to operate it. Inexperienced repairs can result in serious injuries. Your furnace is a miraculous piece of machinery that can turn your freezing home into your own little tropical island. A furnace ordinarily works by pulling the cold air from your house and then blowing it across a warm surface through ducts and back into the home. That warm surface differs between electric and gas furnaces. Gas units use burners and heating plates, while electric units use heating elements. Gas heaters are the standard here in Colorado, and they normally come in either a two stage or single stage unit. What’s the difference? A single stage furnace is the simplest, but it also tends to use up more energy when heating the home. When your thermostat determines that the house is getting a little too cold, it kicks the heater on, and when the house gets warm, it shuts off. Although cheaper on the front end, a single stage furnace could cost you more in the long run. A two stage furnace works similar to a traditional furnace, but with one very important difference. The traditional one stage has two settings: on and off. The two stage, in comparison, will turn on when the thermostat says it’s getting cold, but at only about 66% power. It’ll stay there for about 10-15 minutes and heat the house that way. If the house heats up, the furnace shuts down. But if it’s still cold, the furnace will kick into full power until your home is at the desired temperature.